Today we are in Proverbs 12 with the Good Morning Girls. There is so much wisdom to be gleaned from this chapter! I chose to focus on Proverbs 12:25 this morning during my Bible study time. I want to be an encourager to those around me who are anxious. but an encouraging word makes it glad. Anxiety is defined as "a feeling of worry, nervousness, or unease, typically about an imminent event or something with an uncertain outcome." Anxious feelings can weigh down a person's heart. Encouraging is defined as "giving someone support or confidence; supportive; positive and giving hope for future success; promising." An encouraging word can turn around a heart that's anxious into a heart that's glad! This verse is very timely. It’s easy to get swept up into anxious feelings about the recent turn of events in our world. We have to be careful to guard our heart and mind with the truth that God is still on His throne and nothing that’s happening in this world is taking Him by surprise. Otherwise, we allow our hearts to be weighed down with anxiety over what is happening or what is going to happen. I’ve tried to be an encourager to others by reminding them that God is still in control and that we know the ending of this story because we’ve read it in the Bible. An encouraging word can help a person get their hearts and minds focused back on the hope we have in Jesus. An encouraging word can turn their eyes back to the truth of God found in His Holy Word and off of the Facebook newsfeed and the television news programs. An encouraging word can make their heart glad again! I'd like to end our time today with a prayer for us all. Heavenly Father, help me to be an encourager with my words. May the words of my mouth build up and not tear down. May the words of my mouth be pleasing in your sight and speak life and hope into the lives of those around me who are anxious about anything. I ask that You would fill my heart with words of encouragement from Your Holy Word that I can pour into the anxious hearts around me. Help me to be a blessing in the lives of those who need to hear words of encouragement. I pray for those who are anxious today. You've told us not to be anxious about anything, but in everything, we are to bring our requests to You so that Your peace which surpasses all understanding will guard our hearts and minds. So I lift up anyone with an anxious heart today Father, and ask that You would speak peace, hope, and comfort into their lives. In the hopeful name of Jesus I pray. Amen! Is there something that you are anxious about today? Let me know in the comments. I'd love to encourage you and pray for you! 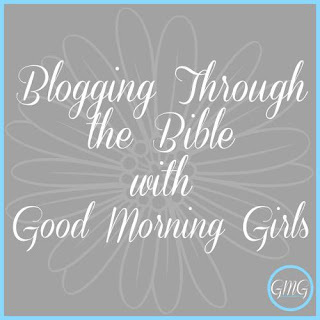 I'm Blogging Through the Bible with Courtney Joseph and other Good Morning Girls! Click on the image below every Friday to read other posts from more sweet friends who are BTTB too! Each week, I am blessed to be able to link-up with the following awesome blogs. While you're here at Grace-Filled-Moments, please take some time to visit my blogging friends listed below. I love being an encourager! It is one of my spiritual gifts. 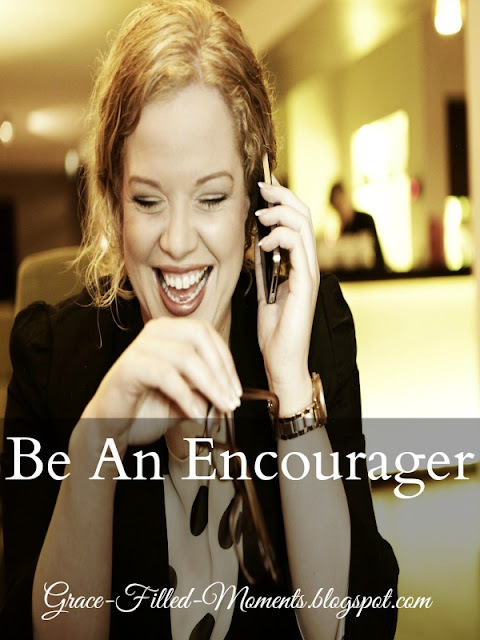 And maybe because I know all too well what discouragement feels like...my desire to be an encourager is fueled. Yes, Aimee, when we know where the other person is coming from it really helps us to be an encourager to them. I think of the Scripture where we are told to comfort others with the same comfort we received from God (2 Corinthians 1:4). Thanks for sharing! God bless you!